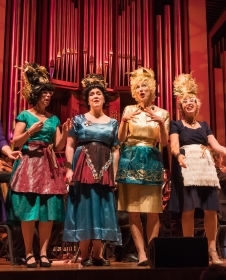 Seattle’s Beaconettes perform topical versions of familiar tunes in four-part harmony. In signature beehive hairdos illuminated by twinkling lights, the Beaconettes are a familiar presence at holiday festivals, Christmas-tree lightings and fundraisers for charitable and progressive causes. In the past decade, the group has raised thousands of dollars for the Pike Market Senior Center and Food Bank, primarily through the Great Figgy Pudding Caroling Contest, where they were named People’s Choice six times. The group has also performed at Seattle Center’s 50th anniversary, PNB’s “Nutcracker,” Northwest Folklife Festival and on Washington State Ferries and Link Light Rail. You can hear the Beaconettes on the soundtrack of Torrey Pines, an acclaimed animated film directed by Clyde Petersen. Led by music director Vinaigrette (a.k.a. Melet Whinston), the Beaconettes reside primarily in the Beacon Hill area, with their families, pets and extra battery packs.